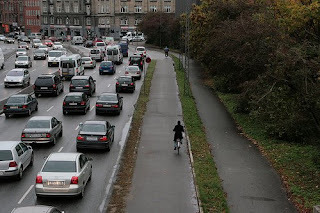 Here is a socialist cycling site: Fahrradsozialismus. It has a nice comparison of "typical cyclists" and Sentai (Japanese for super heros, aka Power Rangers). This reminds me of a crude but brilliant animated piece from a few years back with the three alien bicyclists riding through the city. Now I can't find it, a little help? Some nice looking practical bikes: Paul Frank bikes. Finally, dekochari. This is a word for which I have been looking. For practical advice on cycle repairs, why not visit www.smbbearings.com/BB_BRGS.htm for a great article about replacing your bike's bottom bracket bearings, the photos are a real help too. To help you get a better understanding of bearings & their performance in bikes, check out www.smbbearings.com/SMBtechdata.htm for loads of technical information & help on bearings.